Newly available the Rex Supply Co. Case, not included with the Ambassador Safety Razor. 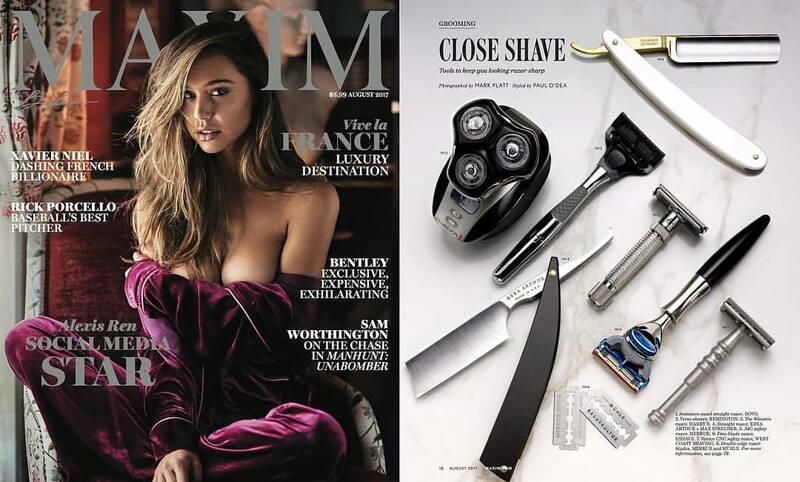 Our experience with razors has inspired a desire to create the best razor possible. We have used the highest marine-grade stainless steel that is corrosion resistant and so advanced it requires specialized machining. We have continued the Gillette date code system (2017 = M) and have included serial numbers for quality control and product registration. We have put years of passion into designing the best razor so you can have the best shaving experience. Shaving with an Ambassador is smooth and efficient - it's very easy to find the right blade angle. And because it's infinitely adjustable, getting the perfect shave is just a matter of turning the dial up or down for a closer or more mild shave. The weight is hefty and balanced right below the adjustment dial - perfect for letting the razor do the work. The Sure Grip knurled handle makes holding onto this razor easy and comfortable - especially in wet conditions. Blade Gap: 0.012" - 0.051"
I received my O series Ambassador on 25 March and have used it daily with Astra and BIC platinum blades with super results. This razor is extremely smooth and efficient at low settings, 1.5 to about 2.5, which was a surprise. It is a true joy to use every morning with Proraso red tube shaving cream and a Georgetown Pottery scuttle that makes warm lather. With the wipde range of adjustment this superbly machined razor will satisfy all. I do not know if this O series is different from the N series but for me it is perfection and a joy to own and use. GREAT razor! My only issue is the jump in aggressiveness in the middle numbers. Other than that, I love it! Outstanding construction. Great balance and weight.Effortless shaving. Couldn't be happier. What an amazing and excellent piece of outstanding machining and super high quality! I've never experienced anything else like it, and I have many fine double edge safety razors. It outperforms my Feather, the Gillette Fatboy, Merkur 34C HD, Rockwell 6S. and all the others in my collection. The all stainless steel construction is unparalleled. I haven't had it for very long, but I've shaved with it on every setting from 1 to 6. using Feather blades, PolSilver Iridium, and Astra Platinum so far. I shave both my face and my entire head with this razor and I've used nothing else since it has arrived! I've found it to be very smooth on all settings, but 1 through 3 have proven to be sufficient enough for me personally. I am lucky enough to own quite a few high-end DE safety razors, two of which are Rex Ambassadors. They unquestionably deliver the finest shave imaginable. It's a bonus that they are also works of art. I have never had a shaving instrument which gave the closeness of an aggressive razor like the Muhle R41 with the soft feel of a Gillette adjustable Fatboy at a number 3 setting. Didn't think such a thing was possible. Since my vision is not what it use to be I only wish the red button on the adjustment dial was easier to see. At 1.75 is the point where I get the best result. The only person to use at 6 would be a vet shaving an elephant ! I love this safety razor. I shave my head and face and this razor can do the job. I’ve used multiple adjustable safety razor but this one has been the greatest. Rex (Ambassador) is the King! This is the adjustable razor I have been looking for. I would say it's an equal to my Karve razor, but due to its versatility, it's better. Unlike other adjustables, position one is efficient, and position 6 is still smooth. It makes every blade and excellent blade. Then there's the stellar build quality, and good looks!